� The Author(s) 2015. This article is distributed under the terms of the Creative Commons Attribution License which permits any use, distribution, and reproduction in any medium, provided the original author(s) and the source are credited. Despite the widespread use of functional Magnetic Resonance Imaging (fMRI), few studies have addressed scanner effects on performance. The studies that have examined this question show a wide variety of results. 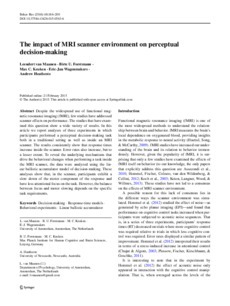 In this article we report analyses of three experiments in which participants performed a perceptual decision making task both in a traditional setting as well as inside an MRI scanner. The results consistently show that response times increase inside the scanner. Error rates also increase, but to a lesser extent. To reveal the underlying mechanisms that drive the behavioral changes when performing a task inside the MRI scanner, the data were analyzed using the Linear Ballistic Accumulator model of decision making. These analyses show that, in the scanner, participants exhibit a slow down of the motor component of the response and have less attentional focus on the task. However, the balance between focus and motor slowing depends on the specific task requirements.